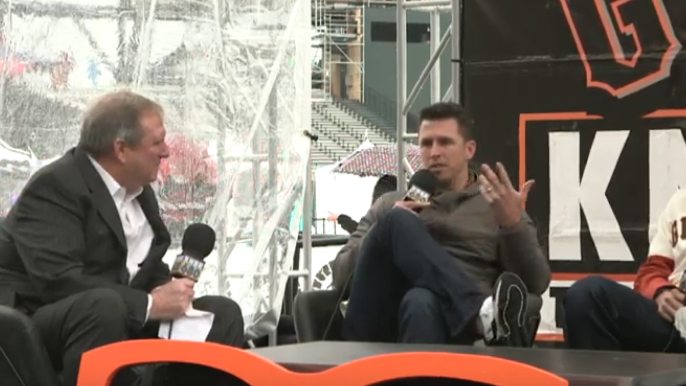 On Saturday, San Francisco Giants superstar Buster Posey talked with Garry & Larry about all things baseball at Giants FanFest on Saturday. Many Giants fans have been concerned about the health of the six-time All-Star, and Posey talked about his rehab so far, as well as how major leaguers have to play through injuries. Posey had season-ending hip surgery in August. “Going through a major rehab for a second time, you know there’s going to be bumps in the road,” Posey said of the comeback process. “So with six weeks left there are some hurdles to cross over and boxes to check, but by all accounts, everything’s gone great and I’m excited to get back out there. Posey also commented on the possible Bryce Harper signing, as well as how those sorts of rumors affect a ball club. “There isn’t a club in the major leagues that he wouldn’t make better,” Posey said of Harper. “He’s done a nice job. He’s been in the spotlight since he was 16, so he’s handled himself well. To watch this and more, you can watch the stream HERE!